If you’re like us, when 30 June arrives we like to take some time and reflect on the year gone by. We look at our achievements, areas to improve on and strategies necessary to reach our goals. 1. Review your communication channels – what’s going out to who and when? Conducting an audit will give you a whole picture of your communications and you’ll be able to see any gaps and cut any channels that are ineffective. Do you really still need the hardcopy newsletter? If you have employees working offline and not digitally savvy, the answer might be yes! For those working online remotely do they feel engaged with the current intranet or online updates? Ask them. You don’t need to wait for the annual survey to come around to get some feedback, and it’ll give you the data you need to make any tweaks. 2. Tweak your communication plan – it’s a work in progress not a final product. Usually once a year, maybe not even that, you’ll get together with all the right people and develop a strategic communication plan. This document isn’t a finished masterpiece but rather a work in progress and a working document to be reviewed frequently to see how you’re tracking against the targets you’ve set. Interestingly, lots of organisations do not even have a comms plan! So, if you’re feeling bad about not doing a refresh often enough don’t—you’re ahead already if you have a plan. 3. Campaign review – what’s worked and what hasn’t? Looking at each campaign critically doesn’t mean you have to be hard on yourself about what hasn’t worked or cover up your failings. It’s an opportunity to grow and learn from the attempts to improve. As the saying goes, ‘if you’re not making mistakes, you’re not making anything’—thanks John Wooden for the quote we agree. Picking apart the program of a recent campaign can set you up with valuable insights otherwise undiscovered. 4. Make of list of influencers – get time in the diary to meet them. Within your organisation, there are people who have the power to get things done. And, with their help you can get your job done with ease. Earmark the influencers, naysayers and fence sitting plotters—it’s good to know where everyone fits in—and figure out how to spend more time in the ear of the influencers. 5. 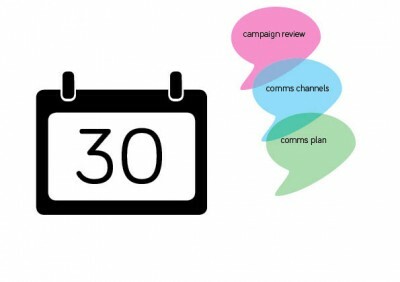 Make a list of the year’s comms achievements – enjoy the successes. Sometimes we tend to focus on what we’re not doing well and forgot to pat ourselves on the back for our achievements. Take the time to make a list of all the things that you have done well through your comms efforts and reflect on why things worked and celebrate the successes. Happy end of financial year (well almost)!